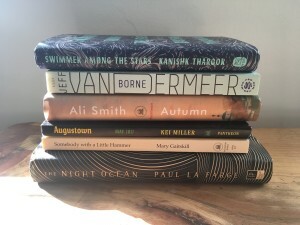 My books-to-read stack took a particularly beautiful turn this month, with gorgeously designed novels by Paul La Farge, Ali Smith and Kanishk Tharoor. As an H.P. Lovecraft fan, I’m really looking forward to La Farge’s book, which seems to be in some capacity about the Old Gods. The sleeper here, I think, is Kei Miller’s book Augustown. I had the pleasure of reading through his book of poetry The Cartographer Tries to Map a Way to Zion (Carcanet Press) for a project at my day job, and he’s without a doubt a top-tier poet. Excited to see how Miller is as a novelist, but I’ll probably go through Tharoor, Smith and La Farge titles first, since they’re already in bookshops.